One artist’s concept of Kuiper Belt object 2014 MU69, the next flyby target for NASA’s New Horizons mission. This binary concept is based on telescope observations made at Patagonia, Argentina on July 17, 2017 when MU69 passed in front of a star. New Horizons scientists theorize that it could be a single body with a large chunk taken out of it, or two bodies that are close together or even touching. 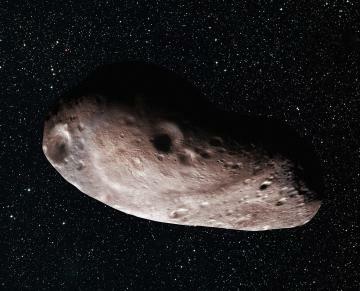 Second artist’s concept of Kuiper Belt object 2014 MU69, which is the next flyby target for NASA’s New Horizons mission. 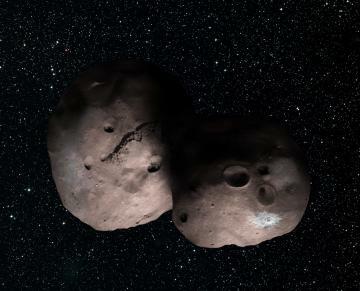 Scientists speculate that the Kuiper Belt object could be a single body (above) with a large chunk taken out of it, or two bodies that are close together or even touching. The ancient KBO, which is more than four billion miles (6.5 billion kilometers) from Earth, passed in front of a star on July 17. A handful of telescopes deployed by the New Horizons team in a remote part of Patagonia, Argentina, were in the right place at the right time to catch its fleeting shadow — an event known as an occultation – and were able to capture important data to help mission flyby planners better determine the spacecraft trajectory and understand the size, shape, orbit and environment around MU69. Based on these new occultation observations, team members say MU69 may not be not a lone spherical object, but suspect it could be an “extreme prolate spheroid” – think of a skinny football – or even a binary pair. The odd shape has scientists thinking two bodies may be orbiting very close together or even touching – what’s known as a close or contact binary – or perhaps they’re observing a single body with a large chunk taken out of it. The size of MU69 or its components also can be determined from these data. It appears to be no more than 20 miles (30 kilometers) long, or, if a binary, each about 9-12 miles (15-20 kilometers) in diameter. Follow the mission and observation campaign at the NASA New Horizons website and the mission's KBO Chasers page.